C. F. Martin 0-18T Model Flat Top Tenor Guitar (1965), made in Nazareth, PA, serial # 200087, natural lacquer finish, mahogany back and sides, spruce top; mahogany neck with ebony fingerboard, gig bag case. Overall length is 35 3/4 in. (90.8 cm. ), 13 5/8 in. (34.6 cm.) wide at lower bout, and 4 1/8 in. (10.5 cm.) in depth at side, taken at the end block. Scale length is 23 in. (584 mm.). Width of nut is 1 3/16 in. (30 mm.). 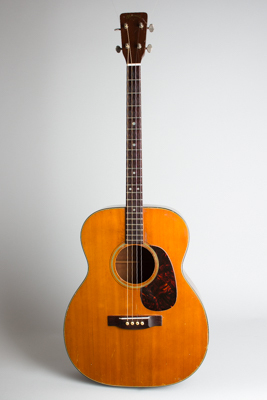 This Martin tenor shows overall wear and tear but remains a good, solid player's instrument. The guitar is all original with no alterations except a recent neckset. There is fairly random wear to the entire instrument; the top finish shows a few deep scratches, pickwear spots, and smaller scuffs and dings, with marks around the bridge where it was re-attached. The back finish also shows a couple of fairly deep scrapes, and a lot of small wear spots. There is one long top spruce grain crack above the bridge, sealed up with no added finish. There is a sealed crack on the outside of the heelblock through the endpin area, and several sealed grain cracks on the back. The frets have a bit of wear but still play fine. Overall a bit beat up but nonetheless very easy playing and good-sounding example of Martin's-and the world's-most popular tenor guitar. Very Good Condition.